If you are looking to set up an owner/operator business then you virtually cannot go wrong if you decide to set up a commercial laundry business; it could be that you decide on a coin operated launderette, or you start at the next level with a laundry and ironing shop, or a full service commercial laundry. It tends to be a recession proof business, as hotels still need fresh bed linen every day and staff need fresh uniforms and work wear. So let us look at a few ideas to think of when you are setting up your business. Location - If you are operating a service where people are going to drop off laundry for cleaning and ironing, as well as dry cleaning then you will need a location where there is plenty of parking nearby. Being near to a high footfall traffic area is also a plus. However if you are running a commercial laundry service then you can be out of town as you will be collecting and delivering to and from customers. Services - You will need to talk to your proposed gas, water and electric suppliers to ensure that they can supply adequate services to your premises without the need for expenditure to upgrade the services (Which can be very expensive if you need a larger gas supply fitting as an example). You will also need to consider space for a water storage tank to supply your washing machines, and you should check this with your commercial laundry equipment supplier. This is an area that can be overlooked but you may need to find space for a 300 to 500 gallon tank. You will also need to check with them as to whether any of the commercial laundry equipment needs a three-phase power supply. When it comes to equipment remember to allow space for extra machines for future expansion. 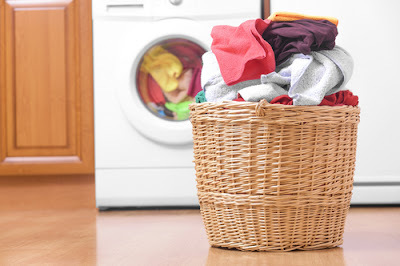 A basic laundry may consist of 6 to 8 washing machines and 6 to 8 tumble dryers. 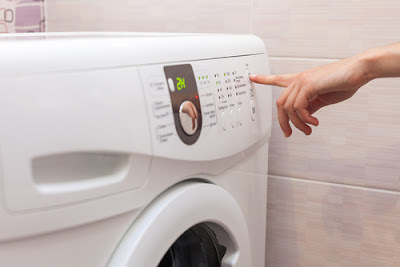 The size of these machines will vary depending on your throughput and you should consult with your equipment supplier to ensure that you buy the right laundry machines for your proposed loads. You will also need space for hydro extractors and ironing machines. The hydro extractors are used to remove water after the washing process, and can be so effective at doing so that sometimes garments can just go straight to the ironing process. You will also need an area to store finished goods, as well as an area to store goods awaiting laundering. The above are the minimum basic points you need to look at when setting up your laundry, but if in doubt about anything always check with your laundry equipment supplier. The simple act of creating a laundry schedule can often streamline this chore. Even if you live alone, creating a laundry schedule on a whiteboard can help you keep on track with the laundry. Of course, if you have a spouse or children, you can also share the work of doing the laundry. Simply devise a schedule for doing the laundry that works for you and your family, marking it on the board. In some cases, you might want to assign a certain day to each family member, so that they know which day they should be doing their own laundry. Or, assign a day for different loads of laundry, such as washing towels on Mondays, jeans on Tuesdays, and whites on Wednesdays. By creating a schedule that spreads the laundry out over the entire week, you won't end up having piles of laundry to do on the weekend. Most people find that they can do the laundry much faster and easier if the clothes are sorted at the time they are tossed into the dirty clothes hamper. Use different hampers for different kinds of laundry, such as devoting one hamper to towels, and another to jeans. There are even compartmentalized clothes hampers that you can purchase to save floor space while still pre-sorting your laundry. Because you can simply grab a load of pre-sorted clothes and immediately get the laundry started, this method can also reduce the tendency to procrastinate. In order to get more work done in less time, multi-tasking while doing the laundry is a great idea. If you schedule other chores at the same time, you can efficiently utilize the time periods when the laundry is spinning in the washer or the dryer. If your washer and dryer do not have an audible signal you can hear when the load is finished then use an oven timer. It can be a great feeling to know that laundry is getting done while you are busy working on other household chores. Even if you develop a method for getting clothes washed and dried on schedule, you might still have the problem of clean laundry piling up around the laundry room. Although it can be tempting to consider the job done as soon as the clothes are dry, that's really only the first step. Be sure to fold or hang your clothes promptly as they are removed from the dryer, to reduce the need for ironing. Wall hooks, a clothes line, and a table are all handy in the laundry room for folding and hanging clean clothes. When finished, transfer them to the appropriate closet or drawer instead of letting them sit in the laundry room indefinitely. 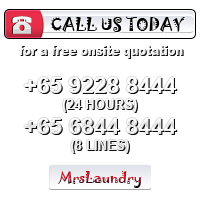 Singapore laundry services follow the above criteria for their perfection. Just give it a try and you won’t regret the ultimate outcome.